The last year has been exciting. I can proudly say that this hobby of eating too much (Ahh see what I did here and in the first sentence!) and showing you all about it has really taken off. When I started the year, I had the goal to really grow the Instagram account, grow the blog, work more with restaurants and meet new people. I’d say I accomplished half of my 2018 goals. I posted a similar year-end recap at the end of 2017 seen here. Over the last year, I posted over 300 pictures to Instagram. You all Liked those posts over 47,500 times. 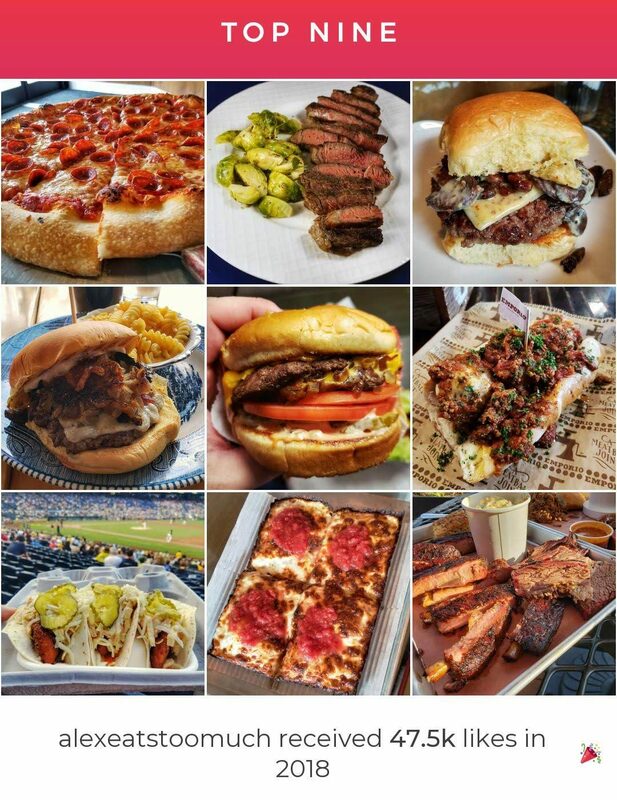 My top posts for the year mostly contained burgers, pizza, and beef. Occasionally you liked photos of mine that contained me eating, but I didn’t post those much over the year. Maybe I’ll do that more in 2019. I also only wrote 12 blog posts in 2018. This is half of what I wanted to post. Hopefully, I’ll do that more too in 2019. 2,000 Instagram followers by the end of 2018. I’m at 2,001 followers at the time of writing. I’d say I hit my mark. The most confusing thing is the number of followers grows in waves. Sometimes I’ll get like 20 in a few days and other times the number will drop 5 in a day. Sometimes it won’t increase for a week. The follower growth helped increase through some other goals that I hit. Collaborate more with other lnstagrammers. I got started on this later in 2018 than I wanted to. I wanted to meet with other local foodies and bloggers to expand the network and make new friends. This started mostly with the meetup dinners at Smallman Galley and Federal Galley in June and July and eventually grew to regular dinners, meeting at events and occasional drinks. I’ve met some great new people doing this and we’ve had some awesome dinners both at restaurants and people’s homes. This is something I hope continues well beyond this year. Attend more food events. I made it to three tasting events this year: Western PA Lamb Cookoff, One Bite One Day, and Savor PGH. These were all incredible events where I got to try some fantastic dishes from some of the best chefs in the Pittsburgh area. I also attended many preview events for new menus are restaurants or entirely new restaurants. I have eaten so many delicious dishes and in some cases found new regular places or new favorite dishes. However, these are not regular events by any means. Take better and more consistent photos. I would say my photos have gotten better by working on plating better, staging the setting, improved lighting, more editing and occasionally a better camera. I learned to edit my photos more before posting. I mostly used Google Snapseed, but also sometimes Adobe Photoshop Express or Lightroom. The thing that helps the most is just making sure I eat tasty and pretty food but also taking lots of photos. Yes, it might take a couple more minutes, but of 20 photos, sometimes only one looks good. Sometimes it’s the first, but also sometimes it’s the last. So what should my goals be for 2019. Write more. I’m not going to set a specific number of posts I want to write, but I need to do more than 12. Keep up collaborating. It’s been so much fun eating with local foodies and getting to know them. I want to keep that going. I also would love to start to meet with foodies in other cities if the opportunity arises. Cook more at home. I did a lot of home cooking in the colder months, but very little when it was warm. I need to cook year round. It’s cheaper. I did try a lot of new cooking at home through Blue Apron, but that isn’t too cheap either. I need more recipes and more drive to go grocery shopping. However, if people want to buy the groceries, maybe I’ll cook for them. Reach out to more restaurants. Sometimes restaurants aren’t thinking about social media or don’t realize it can be a great source of cheap advertising. Getting a bunch of foodies to post at the same time can generate a lot of buzz. Thank you to everyone that has supported me this past year on my eating journey. It’s the people who follow me, like my posts, encourage me to go out or invite me to eat with them that makes a lot of what I do possible. Here’s for an exciting 2019.